As one of the oldest watchmakers in the world, Swiss manufacturer Blancpain enjoys more than 280 years of watchmaking tradition. Throughout their history they have repeatedly produced trend-setting watches. 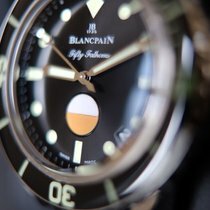 The most notable watch in the Blancpain collection is the Fifty Fathoms. This archetypal diving watch has been demonstrating its underwater capabilities for over 60 years. The Villeret is an elegant classic, named after the Swiss village the company was founded in. Its band selection ranges from the intentionally simple to the richly ornamental. The Léman impresses with its sophisticated complications and sporty feel. This series was the first to feature a tourbillon and flyback chronograph together in one timepiece. Blancpain claims to be the oldest watch manufacturer in the world. Jehan-Jacques Blancpain founded his workshop in 1735, when most people still kept track of the time using church clocks or the sun. In the 19th century, his great-grandchild, Frédéric-Louis Blancpain, expanded the shop in Villeret. In 1926, the company introduced the first automatic wristwatch to the market. 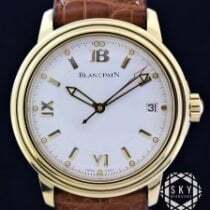 The Blancpain family withdrew from the company in 1932 and left it in the hands of two trusted employees. Blancpain created quite a stir in the 1950s when they came out with the Fifty Fathoms and the Ladybird, the world's smallest automatic wristwatch at the time. 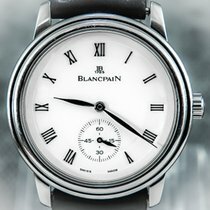 Blancpain countered the success of quartz technology with a return to traditional craftsman techniques. Little changed when they relocated their workshop to Le Brassus and when they joined the Swatch Group in 1992. Today, Marc A. Hayek, grandson of the Swatch Group founder Nicolas Hayek, leads the company. Blancpain still enjoys a high degree of independence under the Swatch Group. They have developed their own movements since merging with Frédéric Piguet in 2010 and introduced 21 new calibers between 2011 and 2014 alone. The manufacturer is afforded a great deal of creative freedom in producing new watches due to this large selection of movements. The Villeret series has over 100 different models with differing complications, such as moon phase and leap year indicators, annual calendars, and perpetual calendars. Many pieces also feature tourbillons and chimes. The high standard of quality is reflected in these small details, which raise their practical value. Some Blancpain watches have an extraordinary power reserve of eight days. However, some movements go above and beyond their practical functions. The 1333SQ caliber, for example, is not only skeletonized but also engraved and decorated by hand. It functions both as a technical watchmaking display and as a piece of jewelry. The Squelette 8 Jours model doesn't feature a dial, allowing the wearer a clear view of the movement. Other movements include both a tourbillon and a carrousel. The two complications compensate for gravity's effect on the movement, and working together, they greatly increase the watch's precision. A tourbillon and carrousel in one caliber is a perfect combination for lovers of intricate watch mechanics. The automatic caliber 1315 has powered the Fifty Fathoms since 2007. It's a robust movement, as it was originally designed for sport watches. Also, thanks to its triple barrel, it has a power reserve of five days. Wearers of this watch treasure the precision of its caliber. It is barely influenced by outside jolts because its balance spring lacks an index and a swan neck. Furthermore, an anti-magnetic cage protects the movement against magnetism. The watches in the Le Brassus series feature a variety of designs. Case materials range from stainless steel to gold and platinum. Bands are made from metal, leather, canvas, or rubber. Streamlined watches such as the 8.7 mm thick Villeret Ultraplate feature nothing but the bare essentials, with just three hands and a date indicator. Other more decorative models have gleaming, diamond-set bezels. In contrast, the designs of most Fifty Fathom models focus on practicality. Features such as luminous hands and index markers, as well as a left-rotating bezel, are requirements for professional diving watches - and the Fifty Fathoms doesn't make any compromises. The Blancpain palette ranges from the markedly technological style of a flyback chronograph to decorative models with engraved landscape scenes on the dial. Renowned watchmaker Vincent Calabrese is responsible for designing some of the newer models. Calabrese, a native of Naples, is well known for his inventiveness and bold designs. 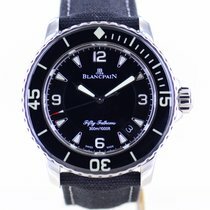 The Fifty Fathoms is Blancpain's most well-known series, and has defined the term "diving watch" since 1953. Few watches can make this claim, aside from the Rolex Submariner which premiered in the same year. Divers from the French marines were able to dive fifty fathoms - around 91 meters, or 300 feet - with the first versions of the watch. It was also used in the 1956 documentary The Silent World by French oceanographer Jacques Cousteau. A short while later, divers with the US Navy SEALs also began to wear Blancpain watches. Modern versions of this legendary watch are water resistant up to 30 bar (300 meters). While the L-Evolution series is likewise sturdy and sizable, it includes a touch of avant-garde style. On the other end of the spectrum are the Villeret and Le Brassus collections. The Léman is somewhere in the middle, mixing sportiness and elegance. This wide-range of models makes Blancpain one of the top watch manufacturers worldwide. The company focuses predominantly on watch enthusiasts whose hearts beat for intricate constructions. Those looking for carefully devised and perfectly constructed complications need look no further. With such beautifully crafted timepieces, Blancpain appeals to the luxury and prestige market.